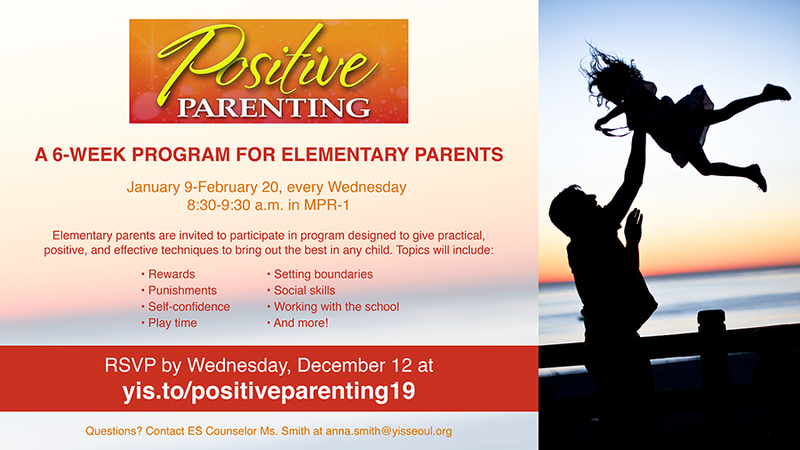 YISS ES parents are invited to attend a six-week parent course called Positive Parenting on Wednesdays from 8:30-9:30 a.m. (Jan. 9-Feb. 20). Developed by licensed professional counselor Scott Riviere over his 25-year career working with children and adolescents, the program offers parents practical, positive, and effective techniques to bring out the best in any child. The course focuses on techniques geared toward 5-11-year-olds. The course will address rewards, punishments, self-confidence, play time, limit setting, social skills, working with the school and more and will be facilitated by Elementary Counselor, Ms. Smith. The course is video-based and includes a workbook. Each week, we will watch the video together, discuss, share ideas and complete the activities and assignments designed to help strengthen your relationship with your child and lead them towards more positive behaviors. Special thanks to our YISS PTO for sponsoring the course and providing light refreshments.